The decision to reintroduce unit Colours for the armed forces of the new Wehrmacht involved many problems. No unit flags and standards had been produced since before 1914. Paul Casberg, the well-known master painter and illustrator, was commissioned to design the new Army Colours, a commission which, in his own words, he considered to be 'the most beautiful order I have ever received'. Packed with numerous contemporary photographs, and eight full page colour plates by Malcolm McGregor, Brian L. Davis's text examines the flags of the Wehrmacht, in this first of three volumes concerning flags of the Third Reich. 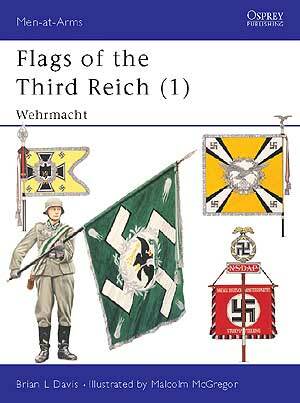 Men-at-Arms 270, 274 and 278 are also available in a single volume special edition as ‘Flags of the Third Reich’.